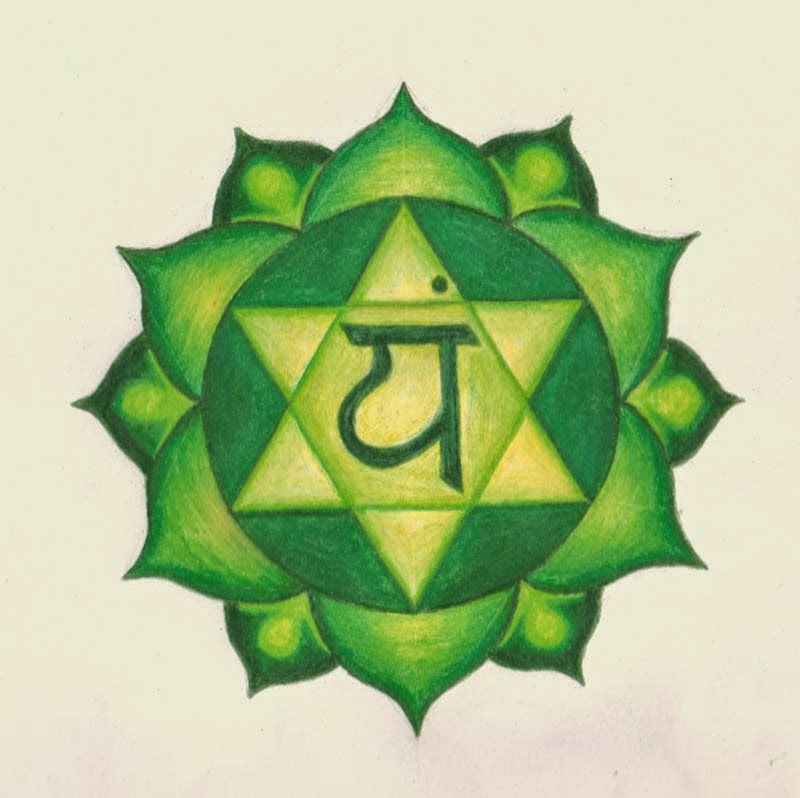 The heart chakra, Anahata, is the seat of balance and love within the body. It’s green color is representative of the radiation of fire from the Manipura chakra. A multitude of pleasant experiences and emotions gather here. The overlapping triangles pictured in the center yantra represent Shiva (masculine) and Shakti (feminine) or rising and falling energy levels. When these opposing forces are in harmony, inner peace and balance has been attained. The extent to which love radiates from this chakra is infinite and dependent upon the depth of our relationships. In order to allow others to feel our infinite love we must open the heart chakra and feel it radiate from our inner self. Kundalini Shakti appears within the heart center as a positive, upward moving force. Skin and the sense of touch are associated with this chakra and hands are representative of giving and taking. I meditated on the heart center keeping my attention focused within and visualizing myself radiating light in a dark place. The mantra ‘Yam’ was repeated a total of four rounds. I practiced the asana sequence Khatu Pranam to harmonize body, mind, and soul.